The Administrative Department is the Executive Department of the Borough. The department consists of the Borough Manager, the Borough Secretary and the Borough Clerk. The Finance Director also operates under the auspices of the Administration Department. The Manager is the Chief Administrative Officer of the Borough. He is responsible to the Council as a whole for the proper and efficient administration of the affairs of the Borough. His powers and duties shall relate to the general management of all Borough business not expressly, by statute or ordinance, imposed or conferred upon other Borough officers. The Mayor is authorized to delegate to the Borough Manager, subject to recall by written notification at any time, any of his nonlegislative and nonjudicial powers and duties. The Borough Secretary is actually the only position in the Borough that is required by Pennsylvania’s Borough Code. 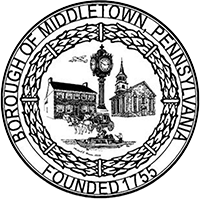 In addition to the duties spelled out by state law, Middletown’s Borough Secretary is also responsible for maintaining all files and records of the Borough, including non-police officer personnel records. The Secretary is also required to sign all resolutions, ordinances, vouchers, checks and all other legal documents of the Borough.